thank you for your visit ! welcome in my bloghouse.. Welcome Marty. It is so nice to have you drop by. Not a silly question at all Jane! It is actually a crystal ball, so no, nothing to do with the irrigator. Now that is truly awesome. Well done! I'm with Jane: I'd like to hear more about this shot! Thought it would spark your interest. 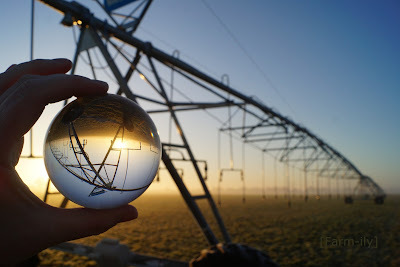 Crystal ball, isn't it what all farmers need!?!? I recently bought this at a local gift shop purely to experiment with photography. They are much cheaper than you would imagine. I'm catching up on your last 6 days!! LOVED every photos, but this one is super neat!!! You inspire me to catch the beauty of our lives!! Thank you Doniene. It is so nice to know that my photos inspire you. That means more to me than you could realise. I am wondering also what you are holding in your hand...whatever it is, I like the result. Very well done! Excellent comment above from Doniene. That's another way of saying what I think. I'm running out of adjectives! Wow, that is very nice !! Now that's an unusual shot. Nicely done. Ha ha was wondering if you went around the farm with a glass ball in your pocket. The shot worked very well.